This comet is interesting not so much for its beauty in photographs, but for a humorous episode. First of all, Mr. Toshio Haneda's comet seeker was a carbon copy of my 88mm f/7 refractor. Many people were amazed at the small size of my comet seeker at the time of the discovery of Comet Seki(1961f) in 1961. Observers wanting to become comet hunters ordered the lenses of exactly the same specifications from the manufacturer which had ground my comet seeker's lens, wishing the same fortune to befall on them. A more surprising thing is these achromatic doublets were ground and figured by hand. The person who ground them was the renowned master craftsman Mr. Takao Namura. It may not be just a coincidence that another observer found a comet using his lens. My small comet seeker later found Comet Ikeya-Seki, too. On September 1, 1978 Mr. Haneda was not quite sure if he should go to his observing site, because of the unstable summer weather. When he was wondering whether he should go or not, his pet dog, his usual observing companion, barked "bow wow." By the dog's prompting, hesitant Mr. Heneda decided to go for observing. An old Japanese fairy tale goes: "An old man heard his dog Pochi barking furiously at the back of the house. Urged by Pochi, he dug the ground and found a mountain of treasure." In case of Mr. Haneda, he went out to observe urged by his dog's barking and found a comet. It was such a happy and amusing episode that I immediately remembered this fairy tale. However, it wasn't all good to Mr. Haneda. This comet he co-discovered with Mr. Campos of South Africa later became completely lost. The comet's orbiting period is five and a half years. At each return of the comet, I have searched for it at Geisei, but been unable to find it. I saw an old man with a dog in my dream. "Mr. Seki, please find my comet," he begged. I don't know if it was Mr. Haneda. It could mean a word of warning to me who has been without any discovery in recent years. Is Comet Heneda-Campos forever lost? It could be that the comet was at an outburst when it was discovered, as it seems to be usually quite faint. There is another interesting thing about this comet. 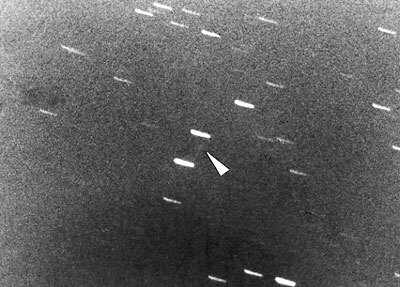 I found a faint comet-like spot on a frame taken during my comet search in 1984 at Geisei. Its motion obviously coincides with that of Comet Haneda-Campos. The image of this comet immediately reminded me of Comet Haneda-Campos 6 years earlier. Its position was accurately measured, but the calculated orbit did not agree with that of Comet Haneda-Campos. It could be a different comet. It could also be that the comet deviated from the orbit because of a non-gravitational effect, though it is less likely. If I can recover Comet Haneda-Campos in my future search, I will certainly offer a photograph of the comet to Mr. Haneda's spirit. Copyright © 2005 Tsutomu Seki.